Picture this scene: You are vising Brazil and you meet someone at the coffee shop. You are happy with the opportunity to practice your Portuguese. What are some of the questions that we can anticipate the Brazilian person will ask? Brazilian: How long have you been traveling in Brazil? Brazilian: How long will you be staying? You: I leave tomorrow. Will be back soon. I have a good friend who lives here. Brazilian: How long ago did you meet each other? Alternatively, you could be asking those questions to a Brazilian traveling in your country. These ‘how long’ questions are very natural. I will show you how to ask and answer them in Portuguese. In Portuguese, use the present progressive tense. Q: Há quanto tempo você está viajando? = How long have you been traveling? A: Estou viajando há duas semanas. = I’ve been traveling for two weeks. Há is the present tense of the verb Haver. We use it to indicate time periods that have passed. How long? = Quanto tempo? Video lesson: How to use the present progressive + Tip to sound natural in Brazil. This is the verb tense to talk about what is happening at the moment. Q: Há quanto tempo você está aprendendo português? = How long have you been learning Portuguese? A: Estou aprendendo português há três anos. = I have been learning Portuguese for three years. How long will you …? Use the simple future in Portuguese. 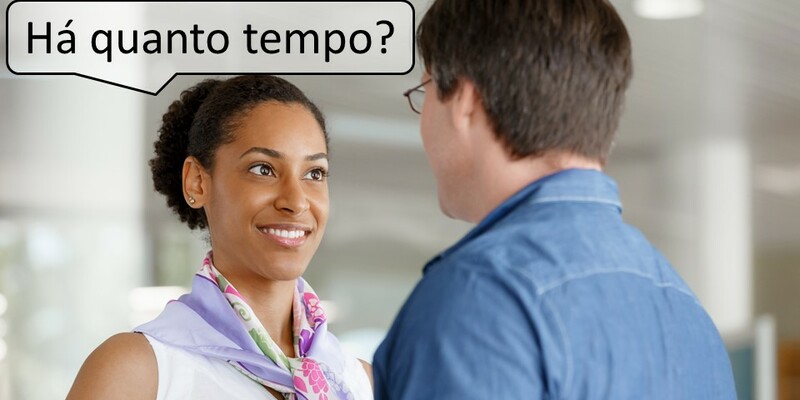 Q: Quanto tempo você vai ficar? = How long will you be staying? A: Vou ficar três semanas no Brasil. = I will be in Brazil for 3 weeks. Learn how to use the verb Ir in Portuguese + 5 Street Smart tips that will make your Portuguese better and more natural. In Portuguese, use the simple past tense. Q: Há quanto tempo vocês se conheceram? = How long ago did you meet? A: A gente se conheceu há cinco anos. = We met five years ago. Practice the simple present and simple past of regular verbs with our flashcards app for Android devices. = Long time, no see! Or: It’s been a while! That’s pretty much it for today. Now you need to practice to make sure you know how to use these questions and answers when you need them. Practicing with other people is critical to retain your new knowledge and make sure you get it right. Street Smart Brazil offers Brazilian Portuguese lessons through Skype. We have a wonderful team of instructors who are well prepared to help you learn Portuguese in a simple, convenient, and effective way. Give us try! Book a Trial Lesson today. Your Portuguese will thank you.